(Community Matters) This missive found me by a circuitous route. Several weeks ago I wrote a column about Ballroom Marfa’s plans to build a drive-in movie theater in Marfa at a cost of $4.5 million. This column is about David Bebee’s drive-in movie theater, which Bebee estimates cost $2500 to build and which is already operating on the lot Bebee leases behind Padre’s in Marfa. He calls the lot Airstreamland because it has five Airstream trailers parked on it in addition to a taco stand, a recycling center, and a 1967 Chevrolet Suburban that once belonged to the University of Texas Department of Zoology, where it was known as Murgatroyd. The Ballroom’s drive-in will have a screen that measures 40 by 52 feet. Airstreamland’s screen measures 6 ¾ by 12 feet and is constructed from 3 sawed-off telephone poles, some 2 by 6 planks, and a piece of plywood. Bebee has given it 3 coats of industrial oil-based paint and plans to add a coat of gray movie screen paint containing glass beads, which costs $300 a can. His projection booth is a metal table with “Cerveza Superior” stamped in each of the four corners, the type of table you used to find in Juarez cantinas. His projector is a $400 Viewsonic digital projector, and the sound system is a loudspeaker and a one-half watt transmitter, which does not require a license but which can be picked up on a car radio at FM 90.1 within a two-block radius of Airstreamland. Bebee says he doesn’t know how many cars the theatre will accommodate because 80 per cent of his audience arrives on foot and sits on folding chairs to watch the films. In addition to his taco trailer, which is currently only open for lunch, Bebee plans to open another trailer called the Rib Krib, where he and Delfin Lopez will make barbecue for moviegoers. 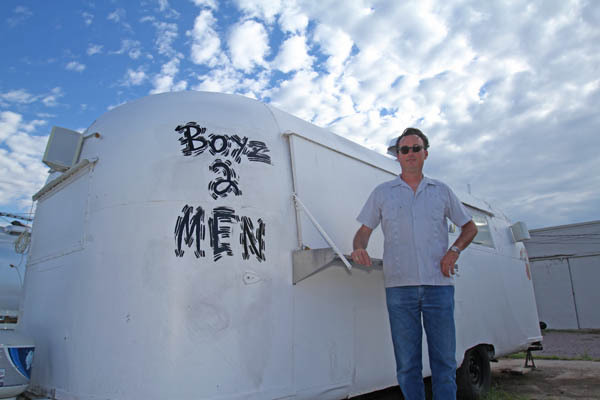 Bebee says that Airstreamland will be the center of a new Marfa entertainment district. “You can watch a movie for a while, eat some barbecue, and then drive to Padre’s, Grilled Cheese, or Planet Marfa and still pick up the sound. It’s not even in the center of town, it’s in the suburbs.” He says that he may ask the city to put up signs that say “Historic Railroad Cultural District” in the neighborhood. Bebee’s conversational style is richly-textured, rapid-fire, and circuitous, and it is sometimes hard to tell when he is joking. He probably could get the city to put up historic district signs, because he has been a respected member of the Marfa city council since 2008. Here is an example of his style. When I asked him how he decided to run for city council, he immediately said, “You can’t fight city hall.” Then he paused for a few seconds, obviously organizing his thoughts, and started telling me what a hard time he had finding a place to live when he first moved to Marfa from Houston in 2006 as a co-owner of Padre’s. He could not find a house or apartment to rent that he could afford, he said, so he planned to live in the building that was to become Padre’s while it was being remodeled. The contractor told him that would be impossible because there was no electricity or running water. Bebee described to me in some detail the condition of the building and the impossibility of living there. Then the scene of the narrative shifted to Houston and the Continental Club, which Bebee managed before coming to Marfa. A customer had left an old Airstream trailer in the club’s parking lot, a trailer that was in terrible condition because it had been in the Florida Everglades for many years. Bebee vividly described the mold and rot in the trailer and told me how a Houston gang had tagged it with their graffiti; how the owner of the Continental Club had told the owner of the Airstream to get it out of the parking lot, offering to store it in the yard behind the club for $500 a month; and how he had eventually persuaded the owner to sell it to Bebee. At that point, Bebee said, “I thought, this town is crazy and I’m planning to open a club here? I decided I would go to every city council meeting from then on and learn how this place works.” He did, and when the 2008 election rolled around Mayor Dunlap asked him to run for city council, saying that he obviously had an interest in city government. Bebee did and won a seat, and has been a committed and productive member of the city council ever since. My conclusion from listening to Bebee is that he has not only superb narrative skills but considerable political skills, and that when he decides to do something it will be done thoroughly and well. I don’t think Marfa will have to wait for the Ballroom’s project to be finished to have a first-class drive-in theatre, and I think Marfa will hear a lot more from David Bebee.